Wine of New Zealand. Viticulture Vertical shoot positioned, cane pruned vines planted at a density of 2525 plants per hectare. The soil originates from an ancient riverbed, comprised of free draining, stony silts with a silt loam topsoil. Winemaking Temperature controlled fermentation in stainless steel tanks with carefully selected yeast strains, chosen for their ability to capture the full aromatic intensity and complexity of Waihopai Pinot Grigio. The Colour The Ned Pinot Grigio signature pale salmon blush. The Aroma A bouquet of ginger spiced, nectarine and golden skin apples with the delicate floral lift of fresh cut spring flowers. 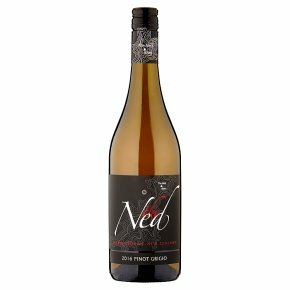 The Palate Extended skin contact on a selection of the ripest fruit parcels is essential for promoting the signature salmon pink colour of The Ned Pinot Grigio. Equally important is the positive effect this technique has on the wine's depth of flavour and overall mouth feel; balance and drink ability is achieved via a fresh thread of Waihopai acidity and the long, lightly drying tannin tail. Crafted to enjoy whilst young and fresh; we recommend drinking this wine within 2 - 3 years of vintage date. Food Matching A highly versatile food wine; our Pinot Grigio has been internationally recognised over several vintages as the best wine match for Cantonese Dim Sim.